Say what you will, but I love Coca-Cola. Coca-Cola makes me feel better, it calms me down, eases my bad nerves. It makes me smile and helps me digest. It makes me feel in harmony. And their Share a Coke campaign was brilliant. Except for their apparent bias against the name Paul. My perfect cola experience is Coke on crushed ice poured from a bottle that says “Paul” and yet I have seen a mere ONE bottle named Paul in 3 years, and that was only because someone bought it for me. I wanted a coke Sunday night. Like really wanted one. The man behind the counter made a um-hum sound after I had the refrigerator display door opened way too long turning and pulling every bottle. I said, “I want one that says Paul!” I guess he didn’t think I was violent or crazy because he said nothing after that. Or maybe his name was Paul too so he understood. I settled for “Travis”. Mostly because I DON’T KNOW ANYONE NAMED TRAVIS. So this mysterious Travis could not in any possible way taint my Sunday night Coke experience. Yes of course I drank the Travis coke. Why else would I have bought it? “Paul” is a fairly common name right? I mean what if Sir Paul McCartney wants a coke? What’s he going to do, drink one that says Monica and wear a French beret? There are a lot of Paul’s. Pope Paul and St Paul, Paul Revere, Paul Anka, and Paul Rudd. Paul Simon and Paul Newman. Paul Ryan (I don’t like him). Paul Stanley (shout out to Kiss fans) and Paul Dirac. Paul Gauguin and Paul Cezanne. Even Les Paul, Ron Paul, and Alice Paul. 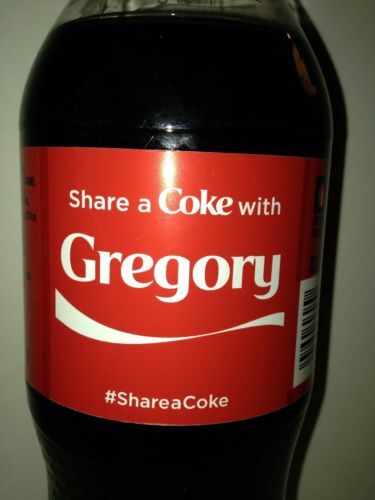 They would probably enjoy a coke that said Paul. And RuPaul. I keep seeing Joanne, like everyone named Joanne wants coke and has bad teeth. Darius? Emma? So now trendy-named infants are drinking coke? Nate, Ray, and Sean. Oscar and Evan. Eric, Erica, and Erika. I’ve even seen Peter and Mary, but still no Paul. I’ve seen Dude and Bestie more than once, because why? Because they think more people are named Dude or Bestie than Paul? Come on Coke-name-people. And I bet I know why Paula Abdul drank her coke out of a glass. It’s because she couldn’t find a bottle that said PAULA. Want to know how bad the Paul-on-a-Coke-Bottle conspiracy is!?!? On the rare singular occasion that they printed Paul on a bottle, it was printed much smaller, even though Paul has fewer letters. See for yourself. Notice the size of the “P” vs the size of the “T” and compare the size of the letter “a” in both. This is not photoshopped friends. Well if anyone from Coke is reading this, don’t worry Coke. I still love your product. I’ll keep buying it. Maybe I’ll pick Logan next time. It has an “a”and an “l” in it at least. The font size difference is so weird!!! Come on Coke! Ha ha ha ha ha ha ha very witty. I almost forgot RuPaul. Bet she’d enjoy a coke too. I am a Coke addict. I go through about 2 liters a day on a good day. However, and you’re going unfriend me maybe, I only drink Coke Zero. Although I like regular Coke and I love Cherry Coke, they make my teeth sticky and I hate that feeling. Ha I am not judgemental at all, so all good on what ever you like. A good way to cut back on your soda intake is to mix it with rum. 😎 ha ha not really. I Know. You’re absolutely right. I have actually cut back on Coke. I start off with water and juice in the morning. Maybe I can phase it out.